43148 Gunner Geogre Henry Hammett of the 14th Siege Battery, the Royal Garrison Artillery. Son of Frederick and Emma Hammett of Torbryan. Born in Ipplepen in 1892. Died 23 May 1917 aged 25. 18020 Private Alfred Samuel Badcock of "C" Coy, the 3rd Battalion, the Canadian Infantry. Son of John and Mary Ann Badcock of Woodland. Born in Denbury in 1887. Died 2 May 1915 aged 28. 9350 Private William Henry Lambell of the 2nd Battalion, the Devonshire Regiment. Son of William and Emma Lambell of Ashburton. Born in Chudleigh in 1894. Died 1 July 1916 aged 32. 61299 Gunner Harry Hawkins of the Royal Garrison Artillery. Son of Harry and Harriet Hawkins. Born in Abbotskerwell in 1887. Died 5 December 1917 aged 30. Awarded the Military Medal. 153810 Sapper Reginald Potter of the 82st Field Coy, the Royal Engineers. Son of Mark and Laura Potter of Torbryan; husband of Hannah Potter of Plymouth. Born in Staverton in 1894. 50341 Private (Arthur) Edward Atwill of the 2nd/6th Battalion, the Royal Warwickshire Regiment. Son of Samuel and Annie Atwill of Torbryan. Born in Broadhempston in 1900. Died 8 May 1918 aged 19. SS 118030 Able Seaman Francis Albert Morgan of HM Monitor 31. Son of William and Priscilla Morgan. Born in Bristol 20 April 1900. Died of drowning 22 March 1917 aged 17. 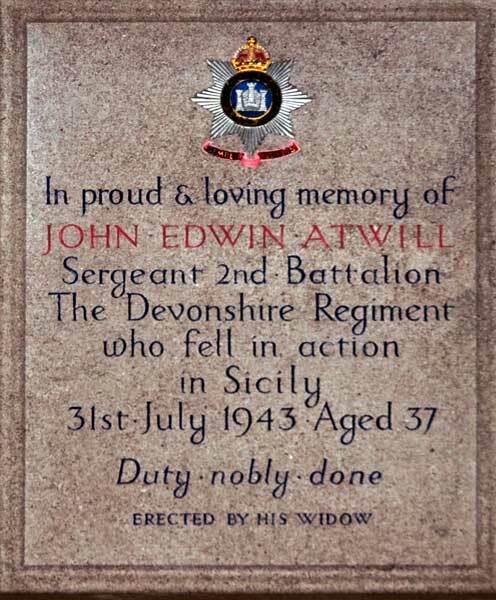 5616631 Lance Sergeant John Edwin Atwill of the devonshire regiment. Son of Samuel and Annie Atwill of Torbryan; husband of Gladys Atwill of Torbryan. Born in Torbryan in 1905. Died 31 July 1943 aged 37. 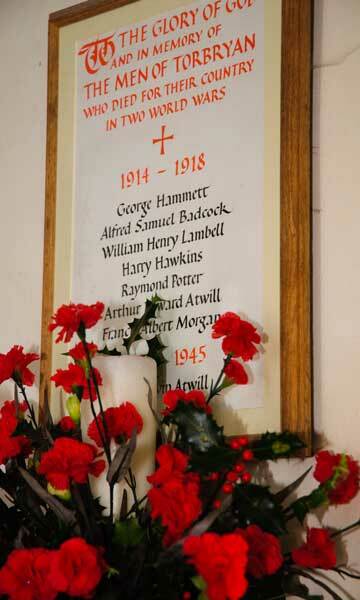 NOTE THE DEATH OF (ARTHUR) EDWARD ATWILL, SON OF THE SAME PARENTS ON THE 1914 MEMORIAL.